Get your party started with this exciting, interactive flash mob. This offering is just the latest in the trend of using choreographed dances to motivate your guests to get up and move. 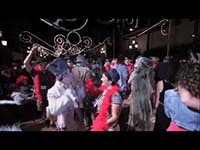 Complete with original choreography, a varied number of professional dancers, and the opportunity to have customized music and choreography, this flash mob is guaranteed to ignite your next party.